Russell Museum’s latest exhibition commemorates Russell’s contribution to World War One. We remember those who gave their lives on the battlefields, but also explore what the war meant to those who stayed behind. What we didn’t have room for in the gallery was the story of how Captain Bert Cook came to be awarded the Meritorious Service Medal – originally instituted for award to Warrant Officers and Senior Non-Commissioned Officers of the Army. Cook’s whaler Hananui was requisitioned by the Government as a minesweeper. 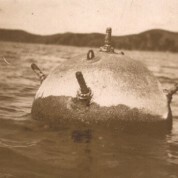 In September 1918 he found this mine floating off Okahu – Redhead. Apparently it was one of twenty-five mines laid by the German raider Wolf . One of those mines caused the loss of the Wimmera, 3022 tons, off the Three Kings in June. Eighteen mines were later swept there. This one travelled quite a distance before being found. Cook and the Hananui towed it in to Matauwhi Bay. There it was anchored, under guard, and later towed to Veronica Channel and despatched by the minesweepers Simplon and Nora Niven.